Finally, a pocket sized field sharpener with the features of a full-sized sharpener. 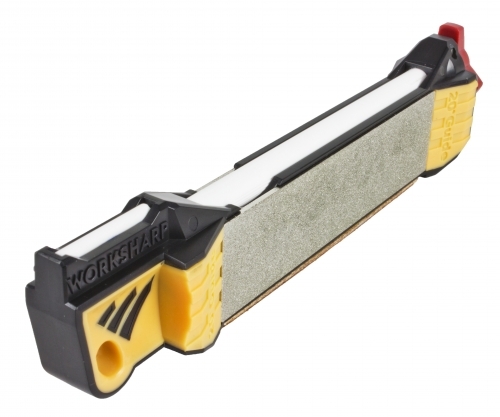 The Work Sharp Guided Field Sharpener is a compact sharpener with the features of a whole sharpening system. What makes the sharpener so unique? The combination of grits, the guide angles that help you keep that important sharpening angle for perfectly sharpened edges, and lastly, the price. The key to sharpening a knife is finding and keeping the proper angle when sharpening. The two most common angles are 20 and 25 degrees. A 20 degree angle is used when you want a finer, sharper edge. A 25 degree angle provides a more durable edge. The Guided Field Sharpener features 20 and 25 degree angle guides for each of the grits. In addition to sharpening knives on the 5 different grits, this sharpener has extra features built in. While most sharpeners will only sharpen standard edges, the Field Sharpener will sharpen serrated edges on a small diameter ceramic rod. A grooved ceramic fish hook sharpener brings a nice point to hooks. The sharpener uses strong magnets to keep the diamond sharpening plates in place. Under the plates there is a small storage compartment and even a broadhead wrench that will accommodate both 3 and 4 bladed broadheads. Overall length 6 3/4". The diamond sharpening plates measure 4" x 1". Q. Are the diamond and the ceramic grits the same? A. No, while labeled fine and coarse, the ceramic grits are both more fine than the diamond grits labeled fine and coarse. The grit progression from most coarse to fine is as follows: Coarse Diamond, Fine Diamond, Coarse Ceramic, Fine Ceramic, Leather Strop.